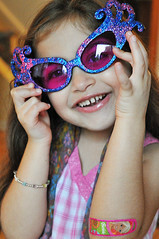 Last Saturday we went to a birthday party, and in the goody bag Muffin found this pair of sunglasses. Aren't they cute? Muffindaddi asked her to pose around with them, and this is what he got. Unfortunately the glasses were so full of sparkles we had to get rid of them - Muffin had sparkles in her eyebrows, face, all over her arms... you get the idea. And that's only after wearing the glasses for a little while. Too bad, they were so cute!